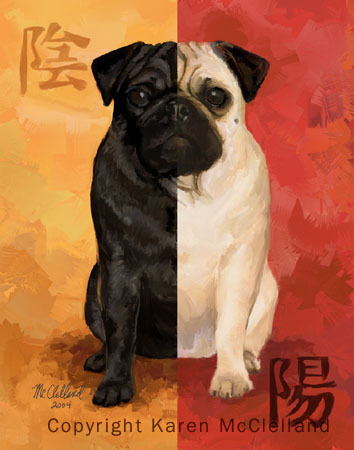 Pug limited edition giclee art print, dog painting done by artist Karen McClelland titled "Yin Yang"
Pug dog print titled "Yin Yang"
Here is Yin & Yang, my version of the chinese symbol for the two energies which cause everything to happen -- they can not exist without each other. Other Pug print. Hand signed and numbered by Artist with Certificate of Authenticity. Prints shipped USPS insured priority mail. WA state residents please add 8.5% tax. If you are interested in hearing when new prints are released, or upcoming contests -- please sign up here. Which breed(s) are you interested in? Contact information received on entry forms is not shared with any other parties. Dog paintings by Karen McClelland © 2001-2005, All rights reserved Copyright shall at all times remain vested in the Artist. No part of the work shall be used, reproduced, stored in a retrieval system, or transmitted in any form or by any means electronic, mechanical, photocopying, recording or otherwise, without the Artist's express written consent.